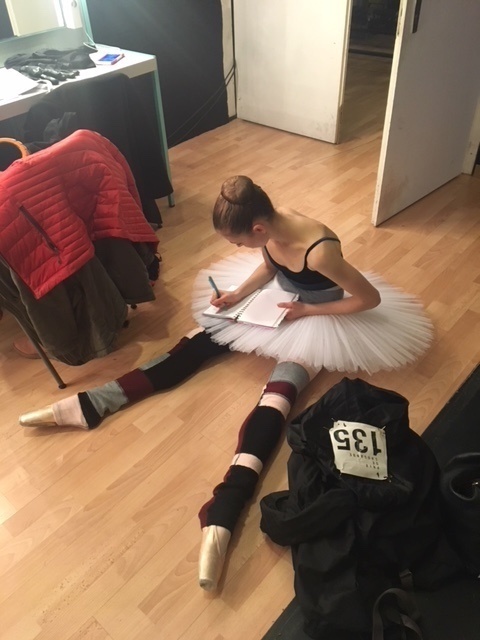 Aviva Gelfer-Mundl competing at the 2018 Prix de Lausanne. Photo by Gregory Bartadon, Courtesy Prix de Lausanne. At the beginning of the month, 74 young dancers from around the world gathered in Lausanne, Switzerland to compete in the 46th Prix de Lausanne. At the end of a packed week, eight candidates were named prizewinners, including 16-year-old California-native Aviva Gelfer-Mundl. One of seven Americans to enter the competition, Gelfer-Mundl—who trains both at V&T Classical Ballet Academy in Laguna Hills, CA and privately with Alla Khaniashvilli and Nazgul Ryskulova Shinn—was the only one to leave as a prizewinner. Pointe caught up with this nascent star to hear about her former career as a rhythmic gymnast, her time at the Prix and her plans to study at the Vaganova Ballet Academy in Russia next year. Before ballet, you were a rhythmic gymnast. Why did you make the switch to ballet? I started rhythmic gymnastics when I was around six or seven and I competed for several years. I was actually state champion and winner of the Junior Olympics in level 5. However at age 10 I got a really bad hamstring injury, and that caused me to reconsider if I really wanted to continue the sport. I wanted something easier on the body, so I started ballet and immediately fell in love with it. Do you find that your experience with gymnastics helps with ballet? Definitely. I learned the essentials in gymnastics, like how to pick movement up quickly and deal with transitions. But in ballet you have to be much more elegant and expressive with the music, where in gymnastics it's more about the tricks. What were your two variations at the Prix de Lausanne? One variation was from Paquita. The second was Touch, Feel, Sense by Louise Deleur. They were totally different both in dynamics and artistry. In Paquita I felt I had to be very flirtatious and jumpy, but in Touch, Feel, Sense, like the name suggests, it was really about feeling the music. What was the highlight of your time at the Prix? The experience itself was a highlight. Also, working with the choreographers was really incredible because they gave me so many great corrections that I'll forever cherish. The rake! I fell a few times during the first few days, but as the week progressed it started to get better, and by the end I came to like dancing on it. It helped to adjust to it by keeping my back in place and having a good core. What was it like to interact with other dancers from around the world? I made a lot of friendships that I will for sure hold on to. It was really great to be in an environment with so many great dancers at a completely different level than anything I'd ever experienced. Backstage at the Prix de Lausanne. Photo Courtesy Gelfer-Mundl. How do you manage your nerves before a competition? I take three slow deep breaths to calm my heart rate and then I'm ready. Sometimes I also watch meditation videos to relax my brain. Do you know where the scholarship that you won at the Prix will take you? Because I'm in eighth place I had to wait for the Prix to accommodate the first seven candidates, but I can now announce that I'll be training at the Vaganova Ballet Academy in St. Petersburg, Russia next year. I know that I will miss my family and friends back home, but training at the school has been a dream of mine since I started dance. I have never been to Russia and I'm excited to visit the historic landmarks in St. Petersburg. What's something that you like to do outside of ballet? I like to cook and spend time my sister and my dog and my whole family, especially my grandparents. Do you have any advice for dancers entering the competition circuit? Enjoy every moment of the experience because you ever know if it's going to happen again.